Saturday sees the return of Premier League football after what seems an age since the Stoke game. The two weeks in between have seen a further two clean sheets for Ashley Williams along with Joe Allen surely establishing himself as a first team regular for Wales. The trip to Norwich pits 9th against 10th with two teams full of confidence and self-belief and I think that's going to produce a game that'll be full of goals rather than a tense affair if the teams were 19th and 20th. Both sides are a long, long way from safety but will see this as an opportunity to put some distance (however brief) between themselves and the bottom three. Norwich received a lot of praise (but ultimately no points) for their performance at Man Utd having an impressive 17 shots. 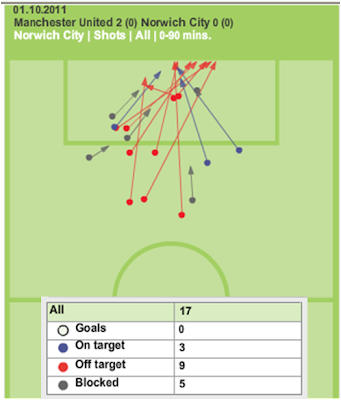 When comparing the last 4 games played by each of the two teams, it can be seen that Norwich have a far higher number of shots per game. While Swansea tend to follow the Barcelona approach of having a Plan A and sticking to it, Norwich are a bit more versatile with a narrow approach against Man Utd compared to a much wider game plan against Sunderland. Overall betting sees Norwich as favourites at 5/4 (44%), the Draw is 12/5 (29%) and Swansea 5/2 (29%), giving an overall margin for the bookies of around 2%. I see this as being quite an open game and my prediction is for a ding-dong battle and a 3-2 Swansea win which is available at 40-1.